Tinder, Grinder, Lovoo, Jaumo, Happn, Bumble, Zoosk, OkCupid, Hinge, Match.com, PlentyOfFish… The list of dating apps in these estranged times could go on and on. Trying to find the love of your life or at least the date for the weekend has never seemed easier! But long before dating became an online business, people were looking for creative ways to fulfill their romantic endeavors. 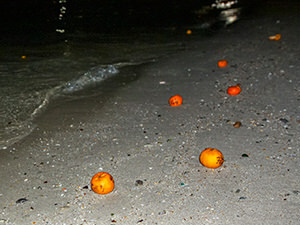 On the 15th day of the Lunar New Year, unmarried Chinese girls would gather at the beach and throw oranges into the sea. 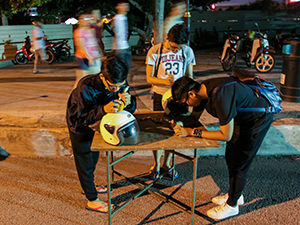 This unique tradition which would hopefully bring them a spouse, originated on the Malaysian island of Penang in the late 19th century and is practiced until today. 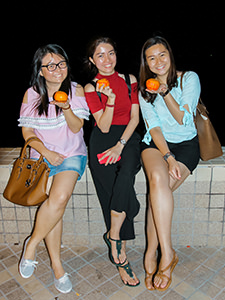 Chap Goh Mei is the Chinese Valentine’s Day, the day when the singles flood Malacca Strait with tangerines, in hope to start the year by finding – love. On the evening of Chap Goh Mei, thousands of wishes float in the sea in front of the Fort Cornwallis in George Town. The most massive Malaysian standing fort is as old as the orange throw tradition and is the part of UNESCO World Heritage Site. Romantic place for romantic dreams. To this day, Penang Island is referred to as the Island of Pearls. But it could also claim oranges into its title. 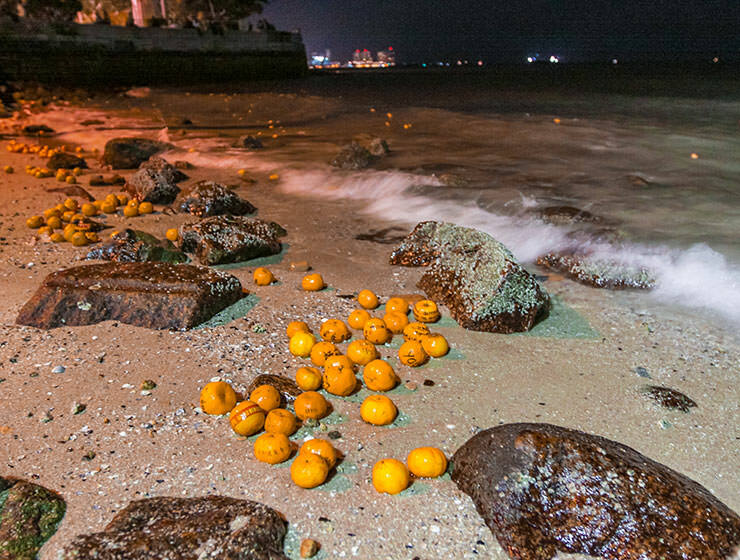 Throwing mandarin oranges into the sea on Chap Goh Mei (literally fifteenth night, in Hokkien dialect) is a Chinese tradition not found anywhere in China! All Chinese celebrate the start of the Lunar New Year, but Chinese community in Malaysia claims copyrights to this Tinder before Tinder. However, oranges do present the symbolical capital of celebration. On the first day of Chinese New Year, people visit their families and friends. Often they bring presents; oranges are there to symbolize wealth. Malaysian Chinese end the cycle of celebration on the last day of the New Year, the 15th day, by transforming this golden fruit into love bait. The origin of the tradition is not entirely clear, but some claim it stemmed from a Chinese proverb: “Tim kam, keh hor ang. Tim kor, chuar hoe bor”. It means: “Toss a tangerine, marry a good husband. Toss an apple, marry a good wife”. In the old times, young girls were not allowed to go out. But on Chap Goh Mei, this prohibition would be removed. The girls could go strolling the streets and visiting temples without their parents, as long as their maidens would accompany them. They would dress up in their best, because they knew that the boys would be looking. The legend said that the matchmaker from the moon would tie red strings of destiny around their legs – bringing the couple together. After you find Mr. Right and hear the wedding bells, consider this honeymoon idea. Besides firecrackers, the love ballads would create the sound background during Chap Goh Mei. In the streets, Dondang Sayang would be performed with a violin, two drums and a gong, while Baba and Nyonya singers would exchange love poems, sometimes injected with humor. 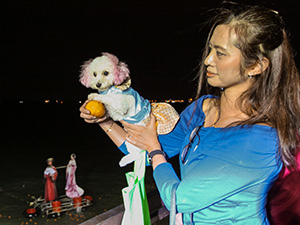 However, the peak of the love folklore on Chap Goh Mei would be reached in the evening. Girls available for marriage would head to the shores and inscribe messages on the oranges before throwing them into the waves. Today, one orange costs 2 Ringgits (40 cents), which makes it an excellent business for the market stalls lining up the Gurney Drive. Large crowds attend the event boosted by traditional cultural performances and typically tempting offers of Malaysian gastronomical capital. Today at Esplanade, George Town’s famous waterfront promenade, everyone is throwing oranges. Girls, boys, singles, married… It almost feels that the tradition of single women hoping the sea would bring them love, was replaced by a belief that the sea (or some golden fish living in it?) would make just any wish come true. 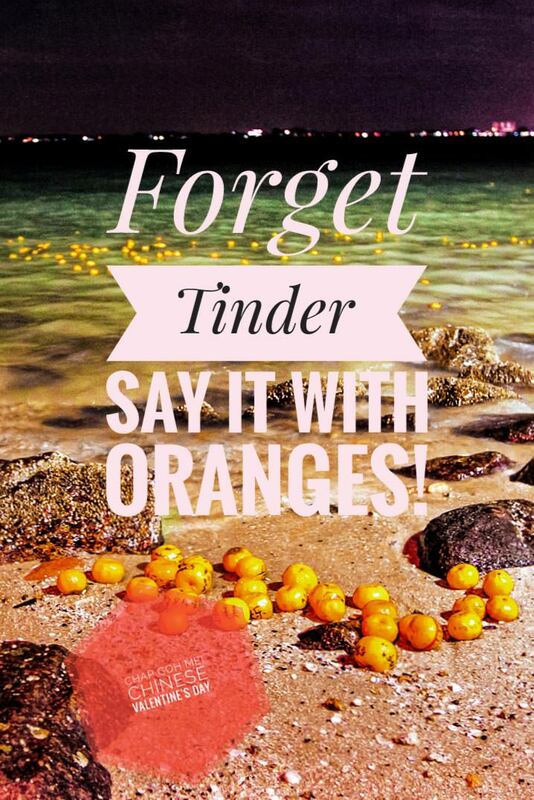 Instead of jumping into the sea to gather as many “free” blind dates as possible, the boys of today are also throwing oranges, missing the point entirely. It seems everybody is absorbed by Valentine wishes, so much that they do not realize that they are the ones who can make them come true. All the single ladies do not lose hope. But if there is no one to pick up the oranges, what divine intervention will connect the hopeful couple? The matchmaker from the moon is not almighty, after all. Chap Goh Mei might not guarantee a hookup these days, even if one buys all the oranges in the world. Maybe, under the New Year’s optimistic moonlight, the eyes of two orange throwers miraculously could meet and result in an improbable outcome. If not, the flirting apps can always be plan B. What is your favorite Valentine’s tradition? Do you hope the destiny will serve you or you actively try to create your love path? Please share your thoughts in the comment section below! Searching for a place to stay in George Town, Penang? This is so fascinating! I’ve never even heard of this before but it’s such a cool tradition!